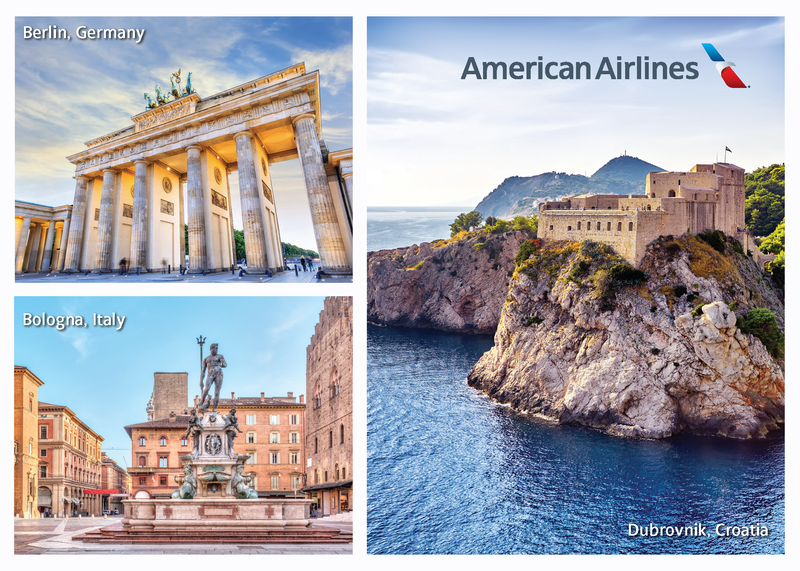 Newsroom - American Airlines Expands European Footprintand Modifies Asia Service - American Airlines Group, Inc.
FORT WORTH, Texas – American Airlines is expanding its European network next summer with nine new routes designed to meet customer demand. Additionally, given the current fuel and competitive environment, American will suspend service between O’Hare International Airport (ORD) in Chicago and Shanghai Pudong International Airport (PVG) in October and seek a dormancy waiver from the U.S. Department of Transportation (DOT) for the route authority. American will also reduce service between ORD and Narita International Airport (NRT) in Japan from daily to three days per week, effective in December. American will add three new destinations to its network with the introduction of service between Philadelphia International Airport (PHL) and TXL, BLQ and DBV next summer. These seasonal flights will be operated June through September on Boeing 767 aircraft, featuring lie-flat business class seats, Cole Haan amenity kits and chef-designed meals with award-winning wines. This summer, American launched seasonal service from PHL to Budapest Ferenc Liszt International Airport (BUD) in Hungary and Vaclav Havel Airport Prague (PRG) in the Czech Republic, as well as from ORD to Venice Marco Polo Airport (VCE) in Italy and from Dallas Fort Worth International Airport (DFW) to Keflavik International Airport (KEF) in Iceland, all of which will operate through the end of October and return in 2019. American will also add a new nonstop flight from Sky Harbor International Airport (PHX) in Phoenix to LHR, complementing existing service from PHX provided by Atlantic Joint Business partner British Airways. With the addition of American’s PHX–LHR service, American and British Airways together will operate more than 70 flights per day to London from North America. Atlantic Joint Business partner Finnair has also announced new service between Helsinki Airport (HEL) and Los Angeles International Airport (LAX), which will begin March 31. American’s new flights will be available for sale Aug. 27. Excited to explore these summer destinations? Download this special postcard to connect with a friend and start planning your next getaway! American will remove nonstop ORD–PVG service from its schedule in October and seek a dormancy waiver from the DOT to permit a return to the market once conditions improve. The last westbound flight will be Oct. 26 and the last eastbound flight will be Oct. 27. 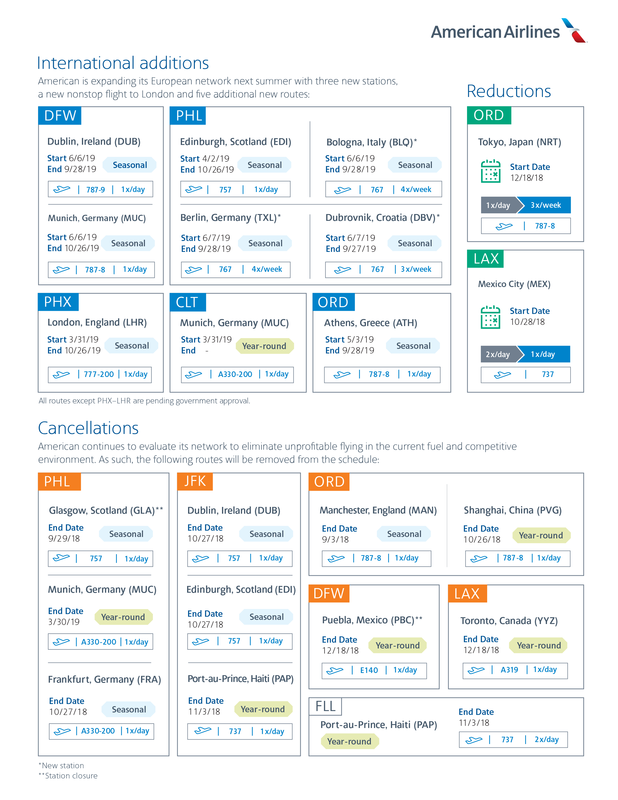 Customers holding reservations after these dates will be reaccommodated on other flights and can continue to reach PVG directly through American’s hubs at DFW and LAX and from ORD via NRT in conjunction with Pacific Joint Business partner Japan Airlines (JAL). American will also reduce its ORD–NRT service from daily to three days per week starting Dec. 18. Together, American and JAL will continue to provide nonstop service from ORD to NRT 10 times per week. During the peak summer season between June and August, JAL will increase its service on the route so that combined, the carriers offer twice-daily service that captures peak demand out of Tokyo. ‍​﻿‌﻿‌﻿​﻿​﻿​﻿​﻿‌﻿​﻿‌﻿‌﻿‌﻿​﻿‌﻿​﻿​﻿​﻿‌﻿​‍Check out the latest episode of Tell Me Why, in which Vasu Raja discusses American's first-ever widebody international flight from PHX, why we believe our new destinations from PHL will succeed, why we’re focusing our Asia strategy around DFW and LAX, our New York strategy and why CLT and DFW continue to grow. Want to learn more about the "why" behind the decisions at American Airlines? Be sure to subscribe to the Tell Me Why podcast on iTunes or Google Play.